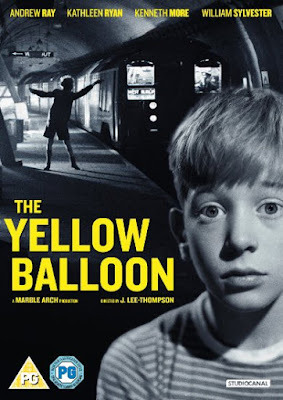 Set in post war Chelsea, London and shows rarely seen version of a bombed out London, The Yellow Balloon is about a quiet well-behaved boy; Frankie Palmer (Andrew Ray), who catches the sight of a man selling yellow balloons from his bedroom window. Eventually convincing his parents to give him some money for the balloon Frankie runs out to buy one, tripping over and losing the money down the drain. Seeing his friend Ronnie with a yellow balloon, he snatches it away from him and Ronnie begins to chase Frankie, which ends in a terrible accident. Unfortunately for Frankie crook Len Turner (William Sylvester) was watching the whole incident, convincing Frankie that he was completely to blame and that if he doesn't do what he says he'll end up being taken away by the police. Too terrified to confide in his parents, Frankie becomes a pawn for Turner, coreced into a robbery that ends in murder. J. Lee-Thompson directed this film very well, although the film has a cheery and light first 10 minutes the film takes a dark and more dramatic turn very quickly. The photography and editing in this film is first class and very interesting to see the way London was in 1953 with still so many bomb sites. It makes for a great dramatic background, especially in the end scenes. With a strong story line, this film still seems quite current and definitely doesn't feel like an old film. The film is rated PG and even though not terrifying or scary, it might be one that most children may not understand. However great for stopping them speaking to strangers. The Yellow Ballon is apart of the BFI's Britain on Film project, in which 1000's of titles will be digitised and made available online via BFI Player, as well as physical release. The Digital Film restoration was funded by Studiocanal in collaboration with the BFI's Unlocking Film Heritage Programme.